The Late Late Toy Show and Christmas dinner feature on the set of six new stamps. New Christmas postage stamps from An Post. 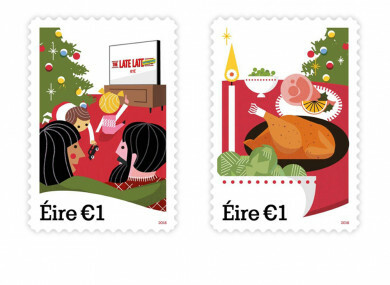 NEW CHRISTMAS POSTAGE stamps featuring ‘The Late Late Toy Show’, Christmas dinner and midnight mass have been launched by An Post. Having received thousands of entries after a call-out to the public, An Post whittled down suggestions. Six themes were then chosen for the festive stamps following an online vote. In addition to the ‘Late Late Toy Show’ and Christmas dinner, the new stamps feature a nativity crib, meeting loved ones at the airport and a child getting ready for Santa’s arrival. People making their way to midnight mass on Christmas Eve is also depicted in the collection of stamps designed by Detail. Design Studio in Dublin. Aileen Mooney, An Post Irish Stamps Manager, has said that “for friends and family abroad, the new stamp designs will bring with them a sense of home. For our customers in Ireland, we want to see everyone embracing the tradition of sending Christmas cards and letters to their loved ones. The new stamps are available in a €19 booklet and a €5 booklet from all post offices and at anpost.com. The last date for posting standard letters and parcels this year is 20 December in the Republic of Ireland and 19 December for Northern Ireland. Email “Toy Show, turkey and Santa Claus: This year's Christmas stamps have been unveiled”. Feedback on “Toy Show, turkey and Santa Claus: This year's Christmas stamps have been unveiled”.